President Pranab Mukherjee’s anguish over the frequent disruption of proceedings of Parliament and state legislatures is widely shared by many well-wishers of parliamentary democracy in this country. Those who have seen the functioning of Parliament in its heyday under Jawaharlal Nehru are deeply pained by the steady decline. MPs have been accused of taking cash for asking questions. US President Barack Obama has taken a policy decision which may have major implications so far as the threat to peace and progress from terrorists is concerned. He has declared that the time has come for the US-led “war on terror” to conclude. Australian Prime Minister Julia Gillard’s assurance to members of the Australia Sikh Association that her government would look into allowing Sikhs to wear turbans at work places and also while riding motorcycles will be widely welcomed by the Sikh community, not only in Australia but also in other parts of the world. In the recent past, Australia had seen some ugly incidents of racial intolerance and thus the Prime Minister’s approach of embracing multiculturalism by allowing freedom to visible minorities to practice their religious injunctions will help repair the nation’s image internationally. Now that proposed wealth tax on farmland within 8 km of the municipal limit of big cities and a little less around smaller ones has been withdrawn not on any economic logic but under political pressure, it still needs to be examined if there is justification for imposing such a tax on farmland. Adam Smith stipulated four cannons of taxation that must ensure equality, certainty, convenience and economy. The “call” to adventure can come in any form from anywhere. It can be in the form of a dream, a message, a letter or a sudden phone call and there you go, all set with your backpack to search for unknown lands. Some trips take years of planning, some just happen and then there are a few which come as a nice surprise to you. Now, this one was a nice surprise family trip to the holy places of Vrindavan and Mathura. The Chinese perspective of raising tensions in Ladakh is not shaped by any altruistic motives of improving its positions on the border or lay claims to new areas. It is a well-planned strategic response aimed at coercion to prevent India from improving its strategic posture in the region. In 2009 the media was abuzz with revelations that China had replicated the whole of Aksai Chin and a large part of the disputed Indo-China border on a large-sized sand model equivalent to the size of six cricket fields, thousands of kilometres away in Huanyangton village near Yinchuan in the Ningxia Autonomous Region (Northern China). President Pranab Mukherjee’s anguish over the frequent disruption of proceedings of Parliament and state legislatures is widely shared by many well-wishers of parliamentary democracy in this country. Those who have seen the functioning of Parliament in its heyday under Jawaharlal Nehru are deeply pained by the steady decline. MPs have been accused of taking cash for asking questions. Pained by the frequent logjam in Parliament, Prime Minister Manmohan Singh was constrained to remark that the world was laughing at India due to the frequent disruption of parliamentary proceedings. The BJP says it is the government’s responsibility to ensure that Parliament functions smoothly. A veteran parliamentarian himself, the President summed up the essence of parliamentary functioning in three Ds – debate, dissent and decision – to which another D – disruption – has been added in recent years. Time was when opposition leaders would register their protest by staging a walkout. Now they stay inside and shout at one another until a helpless Speaker is forced to adjourn the House. A handful of opposition leaders decide whether Parliament is to be allowed to work or not, and the majority is forced into submission. The Opposition has certain rights and privileges in a democratic polity. The rules allow it to raise issues of public concern. There are also rules of conduct for the members. If any member or group of members violates them, the Speaker is empowered to act. Lately, the Speaker too seems to have surrendered the power to discipline unruly members. If need be, the rules should be amended so that order is restored effectively. The President has called up the political establishment to find a solution to the problem. Legislative work cannot be allowed to suffer indefinitely. When Parliament celebrated its 60th anniversary in May last year, the members adopted a resolution moved by the Speaker in which they pledged, among other things, “to uphold and maintain the dignity, sanctity and supremacy of Parliament”. It is time to recall that. The US President’s decision indicates that he wants his country to extricate itself from a situation which had made the US shift its focus from economic and other domestic issues to peace and security at the global level. Ensuring security on the US mainland cannot be expected to be a low priority area in the US scheme of things. But it can no longer afford to ignore America’s domestic problems. His latest announcement also appears to be aimed at changing the US image in Muslim-majority countries where it is treated by people as an enemy nation. Interestingly, Obama’s plan for withdrawing the US from the controversial aspects of the fight against global terrorism has been unfolded at a time when the US-led multinational troops are set to pull out from Afghanistan. Pakistan also has a change of government with the Nawaz Sharif-led PML (N) replacing the PPP of Asif Zardari from the seat of power. Now drone attacks in Pakistan’s tribal areas may almost come to an end for which the new government in Islamabad will get all the credit. No more targeted killings by US drones in both Pakistan and Afghanistan may, however, be interpreted by the Taliban as the victory of extremists over the US-led foreign forces. The extremists may now feel emboldened. Does this mean that they may continue to pursue their extremist agenda? If they do so, the world will be faced with a fresh challenge to security from the elements which were to be eliminated by the US-led war on terror as one of its objectives. Australian Prime Minister Julia Gillard’s assurance to members of the Australia Sikh Association that her government would look into allowing Sikhs to wear turbans at work places and also while riding motorcycles will be widely welcomed by the Sikh community, not only in Australia but also in other parts of the world. In the recent past, Australia had seen some ugly incidents of racial intolerance and thus the Prime Minister’s approach of embracing multiculturalism by allowing freedom to visible minorities to practice their religious injunctions will help repair the nation’s image internationally. Sikhs are exempt from the helmet-wearing rules in provinces like Queensland, Victoria, South Australia and Western Australia, but there has long been a need for a comprehensive federal policy that would allow them the freedom to practise their religion. The Sikhs have a long history of struggling in various nations to be allowed to maintain the external symbols of their religion, including wearing turbans. While Britain and Canada have both exempted Sikhs from wearing hardhats at work sites and helmets while riding motorcycles, at the other end of spectrum is France. Sikh boys studying in government schools in France have been forced to attend school without wearing turbans since 2004 when France passed a law banning conspicuous religious symbols in schools. Students have thereafter not been allowed to wear turbans or headscarves or yarmulkes to school. The issue has become a bone of contention between the French government and the minuscule Sikh community in France. Sikh protests have regularly marked the India visits of important French dignitaries since then. The Indian diaspora, with many distinguished members, is widespread and is making its mark in nations the world over. Indians abroad have a steady focus on their core values and education. There is no doubt that it is incumbent on expatriates to live according to the norms of their adopted nations. However, it is also the duty of the nations that they now call home to provide a congenial atmosphere to the immigrants to nurture their core values, even as they learn about and contribute to their adopted lands. In this, the Australian PM demonstrated the right spirit. Now that proposed wealth tax on farmland within 8 km of the municipal limit of big cities and a little less around smaller ones has been withdrawn not on any economic logic but under political pressure, it still needs to be examined if there is justification for imposing such a tax on farmland. Adam Smith stipulated four cannons of taxation that must ensure equality, certainty, convenience and economy. These cannons were primarily meant to apply on taxing the incomes of the people from the point of view of the taxation authority, the state, to ensure that no one is taxed unreasonably more than the other taxpayers and there is in no uncertainty either for the tax collector or the tax-payer on the amount to be realised as well as the timings thereof. The convenience of collection and payments to be made and the economy in the sense that costs of collection must not exceed the realisations have to be ensured. In the present times the equality should be interpreted in the sense of equitability that may ensure that the burden on the tax-payer matches with his paying capacity. Yet these considerations are often ignored due to the constantly widening gap between the revenue income and the expenditure of the state. As a consequence, the taxes are imposed wherever it may appear to be possible, without any consideration to the paying capacity of the tax-payers. Convenience is interpreted as convenience of the state, not of the tax-payer and the economy is given a go-by that may sometimes lead to the cost of collection exceeding the tax proceeds. Mostly, we see the desperation of the state to collect funds from anywhere in any manner to reduce ever-increasing revenue deficits in their annual budgets. In principle and logically, it is only the incomes of individuals and that of businesses and corporates that should be taxed in a progressive mode and in no case should tax be regressive in its nature. Income tax slabs, deductibles, exemptions, special cesses, surcharges, etc, inter alia, make the income tax progressive and equitable, charging the pockets as they can bear the burden. Indirect taxes such as sales tax are also progressive in their nature and throw the tax net wider according to the purchasing power of consumers. Wealth tax, too, has a positive role to play in certain situations where accumulated wealth, not put to productive use, takes the productive resources out of the production cycle and does not yield income. In this situation, the accumulated wealth in movable or immovable form does not permit the economy to achieve its potential growth. For instance, gold held in private hands locks out the resources from their productive use. In the same manner, industrial as well residential plots lying vacant hold back the potential for production and construction of planned houses respectively and adversely affects the availability of houses. There is justification for imposing tax on such wealth items to force these assets into production process. Yet to impose wealth tax or even property tax on the assets like factories, business premises, shops or any such commercial buildings as yield production and taxable income amounts to double taxation, sometimes triple taxation, first of value of property, then on corporate earnings and also on the incomes of the owners. The product itself invites excise tax, value added tax, sales tax, etc. This multi-level taxation becomes pinching and encourages tax evasion. Not only that, tax on assets already in production discourages investment and squeezes the funds which would otherwise be utilised in expanding the enterprise and/or establishment of new enterprises. It is especially true in the secondary and tertiary sectors of the economy. Yet, all these taxes have become an accepted mode of collection of funds by the state and nowhere consideration is given to the effect these taxes have on investment, production and GDP growth. If direct taxes are imposed on the incomes only in a progressive manner and indirect taxes are levied on purchases made by the people as well as private and public entities, this would ensure conformity with all the four cannons of taxation and would take the tax realisation to the optimal potential of the economy, provided tax evasion is checked with a firm hand and a foolproof system is developed whereby every sale invariably gets recorded and is accounted for as is the practice with corporate and business houses, shops and stores in Western countries and in many cases in India too. In respect of house tax, every family should be entitled to one house, big or small, for self-occupation without any taxation. Houses are owned by people depending upon their earnings which are taxable. Principally, the owners of these houses have already paid income tax on their incomes and have built or purchased the houses out of incomes net of the income tax paid (disposable income). Any house or building given on rent should invite tax on the rent included in the total taxable income of the owner. Thus, property tax or wealth tax, etc, and even house tax carry the relevance only on the assets that are not being used for productive purposes and do not yield any taxable income. This is the logic that meets the four cannons of taxation. It is unfortunate that almost all countries violate these cannons out of desperation to collect more and more funds that are in large part, and often in total, are spent on the revenue account leaving little or no part on capital account for investment, which adversely affects the capacity of the economies to achieve their potential growth. The case of taxation of agricultural land through wealth tax or property tax, etc, that is under cultivation is not very different and is totally illogical. If the land is not cultivated and is purposely kept vacant, there is some justification to tax such a land to force it into the production process. But there is no justification for imposing wealth tax or property on a piece of land which is being cultivated, yields production and income. In a situation where the agriculture sector is already under stress, such a tax can be paid only either through selling out the property or through attachment by the state. The writer is a well-known agricultural economist. A spiritual call in the late 20s may sound a bit too early, but, as they say every true spiritual journey is a quest and we set out to discover something. I too thought of discovering something different this time around. It wasn’t just fun, food or friends, but this trip was all about the ultimate purpose of my life. Certainly, big and uncomfortable questions that led me embark on a spiritual journey. Fascinated by the hot and cool image of the on-screen gods these days, I, too, wanted to connect with the God of cool things in my own way. A true devotee, a real fan of God, I was all set to experience the ultimate balance of the ‘Shakti’ in various forms. While walking watchfully through the tight streets of our holy lands, where even God would think twice to appear, I started planning about how to actually respond to the call? The first thing that came to my mind was what life is all about. Looking around the way people were managing their life despite odds, with bare minimum basic needs of food, clothing and shelter, I thought life was all about associating with the socially oppressed and economically weak. Lost in the crowd, waiting for my turn, crying for God’s attention, seeking his blessing, I thought it’s better to treat other devotees with respect and offer them a silent space to reflect. Looking at those taking tourists and foreigners for a ride, I thought of taking a few moments each day to notice where and how we are. Looking at people wanting, striving and struggling through life, I thought of scripting a gratitude journal as every day is a journey and we all are spiritual beings! I learnt that it’s much easier to coast through life on the surface level. But if we choose to ignore that there is much more to life than the daily rush, and the hoarding of possessions, what happens when we are face to face with suffering? When we get ill, or someone we love leaves or dies, or when we near the end of our life? It’s high time we look out for alignment and move a step closer to the greater God who believes in self-sufficiency, no-greed and no attachment. In 2009 the media was abuzz with revelations that China had replicated the whole of Aksai Chin and a large part of the disputed Indo-China border on a large-sized sand model equivalent to the size of six cricket fields, thousands of kilometres away in Huanyangton village near Yinchuan in the Ningxia Autonomous Region (Northern China). The fundamental question then and today remains the motivation for China to spend money and resources to replicate whole mountains, valleys and water bodies of the disputed area. This, in a sense, puts a question mark on China's peaceful intentions towards India. Satellite images show that China has replicated around 1,57,500 square kilometres on a map scale of 900x700 meters. This is about 500:1 ratio. What is more intriguing is the attachment of a military unit and an artillery firing range in the proximity of the terrain model. Satellite images obtained from Google-Earth suggest this to be a major facility to train PLA troops for operations in high altitude areas of the Ladakh Sector. The large scale model appears to indicate that it is not only for operational planning but also to familiarise both combat arms and combat support arms like artillery, combat engineers and communication experts with the terrain conditions prevailing in the region. The associated firing range indicates facilities for live firing to train for target engagement with various weapons systems in these high altitude conditions. The training is not at a platoon or company level but at the regiment (brigade) level. Today simulators and large sized electronic map boards are the preferred means for training, particularly in modern armies. What provoked China to replicate such a vast area remains unanswered. Probably China wants its troops to have a perception about the world's most tough terrain so that in case of a conflict situation with India, its troops can understand the terrain constraints and plan in realistic manner. Despite increased political and economic relations over the years between China and India, tensions remain along their shared 4,057 km border, most notably over Arunachal Pradesh (which China asserts is part of Tibet, and therefore of China), and over the Aksai Chin region at the western end of the Tibetan Plateau. Both countries in 2009 stepped up efforts to assert their claims. China tried to block a $2.9 billion loan to India from the Asian Development Bank, claiming part of the loan would have been used for water projects in Arunachal Pradesh. This represented the first time China sought to influence this dispute through a multilateral institution. The then-governor of Arunachal Pradesh announced that India would deploy more troops and fighter jets to the area. An Indian newspaper reported that the number of Chinese border violations had risen from 180 in 2011 to more than 400 by September 2012. 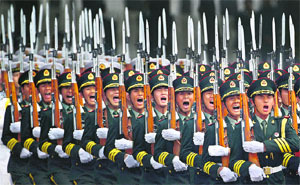 It needs to be noted that in recent times China has enhanced the number of military exercises in Tibet. Some of these exercises have been conducted at altitudes ranging from 4,500-5,000 meters. One such exercise conducted in 2011 included joint drills by the air and ground troops under information-based conditions in frigid high altitude areas. The troops involved included the air force, ground troops, mechanised units and a range of support entities. Providing rare details while describing the exercise, the PLA daily stated, "At the very beginning….the new type of warplanes of the PLA Air Force conducted accurate strikes at the targets… Shortly after seizing the commanding point, the long-range guns launched full-scale shooting at the command post and the artillery position of the enemy. This was followed by the armoured vehicle group and infantry combat vehicles branching out into columns and launching a sudden and violent attack on the mountain passes occupied by the enemy. The special operations detachment outflanked the enemy and raided the enemy's command post". The report also stated that army aviation troops and anti-aircraft missiles provided cover to the attacking units. Chinese moves in Ladakh, particularly in the Depsang--Dualat Beg Oldi sector, although now vacated, highlights China making preparations for a contingency based incursion into Indian territory as part of its "local wars under informationisation model". The Chinese perspective of raising tensions in Ladakh is not shaped by any altruistic motives of improving its positions on the border or lay claims to new areas. It is a well-planned strategic response aimed at coercion to prevent India from improving its overall strategic posture in the region. The Chinese are aware of the infrastructural developments being undertaken by India in Ladakh -- upgradation of airfields, development of communications and strengthening of defences, etc. These developments are backed by planned upgradation of Indian capabilities in terms of troops (mountain strike corps), deployment of missiles and enhancement of intelligence and surveillance capabilities. The Chinese are conscious that were India to mount an audacious offensive in Aksai Chin it could roll down to the Tibetan Plateau and cut off the famous Western Highway, which is the main artery linking Tibet Autonomous Region with Xinjiang -- the route for induction of forces from Lanzhou Military Area Command. Such a scenario is depicted in an excellent fictional account in the book titled Assassins Mace written by Brigadier Bob Butalia (retd), wherein special forces backed by credible air power are depicted as cutting off the Western Highway. The logic behind Chinese intransigence and intrusion in the Ladakh Sector are two fold. First, to get India to dismantle the infrastructure it has developed in south-eastern Ladakh, particularly in the Chumar area and to an extent in Daulat Beg Oldi Sector as well, Second, coerce India to sign a "Defence Cooperation Agreement", which among other things includes mutual pull back from the Line of Actual Control and the creation of demilitarised zones, dismantling the military infrastructure, prevent patrol clashes and sharing of patrolling programmes. Clearly, the above is not acceptable to India, particularly when even after 15 rounds of political negotiations India and china have not reached a stage to exchange maps of the western and central sectors. It appears that in the negotiations leading to the pull back by the Chinese, some assurances on both accounts have been provided. Nonetheless what is important is that the Chinese military leadership is aware that the tipping point in border negotiations is not far with the Indian military's modernisation and the development of strategic infrastructure, particularly the Rohtang tunnel linking the plains of Punjab with Ladakh in Jammu and Kashmir, plans to keep the Srinagar-Leh highway open round the year and not to mention the rail link to the Kashmir valley. These developments, when operational, will provide India with enhanced strategic build up capability in Jammu and Kashmir, including Ladakh. The Chinese are sanguine that they cannot indefinitely use the ruse of "allowing future generations to solve the dispute." Their President underscored this when he declared the need to resolve the boundary issue. This could sooner or later lead to exchange of maps of the western and the eastern sectors. Seen in this context, the intrusion could be an attempt to firm up their positions to ensure operational advantage in this critical sector. China is playing a game of brinkmanship by reinforcing its claim lines and coercing Indian leadership to halt the build-up of defensive capabilities in Ladakh. India's enhancement of its operational profile in Ladakh carries with a price tag for China in terms of forcing it to upgrade its defensive posture in a region where its militarily not that well poised. According to China's recent White Paper on Defence, only four of its 18 combined corps are deployed in areas opposite India. In any offensive option China will need to redeploy large forces from the hinterland into the Tibet Autonomous Region, involving trans-regional mobilisation that will surely be picked up by India's enhanced space and aerial surveillance capabilities. It is in this context that the collusive support between Pakistan and China to keep the Indian armed forces engaged poses serious strategic concerns for India. Lastly, it needs to be appreciated that this is not a localised incident. The Chinese troops would not have taken such a step without full-fledged assessment of the possible implications and a consensus at the level of its Central Military Commission. Surely the consequences of the Indian reaction would have been analysed and factored in. Intruding deep into Indian territory and effectively challenging India created the scenario of a stalemate. The fact that it has been forced to pull back, albeit by the fig leaf of a face saver should chastise the Chinese. A favorable perspective of the incident has been to put the boundary issue back in lime light if not centre stage. The recent visit of the Chinese premier provided a platform to engage constructively to move forward on the boundary issue. It was also an opportunity for both countries to provide a fillip to their bilateral relations.